Running Time: 70 minutes This raw, award-winning documentary reveals the plight of urban children in Congo, Lesotho, Malawi, Zambia, and Zimbabwe. It includes interviews with the children themselves, in which they relate their own moving stories. 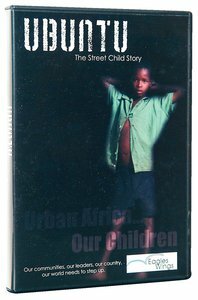 About "Ubuntu: The Street Child Story"
Customer Reviews For "Ubuntu: The Street Child Story"
"An essential and emotional documentary"
This doco details the plight of the street children in Southern Africa. It includes interviews with prominent government officials/ministers and heads of organisations such as UNICEF. It will open your eyes to what these precious (but forgotten) children deal with each day and their fight for survival. There is raw footage, including night shots and you?ll come away with lots to think about! It pulls at your heart, and provides the viewer with the chance to follow 2 little boys' journeys to find their families after being abandoned and living on the streets, which is an emotional venture. The aim is to raise awareness of these children and hopefully prompt people to step out and do something to help - as it's our responsibility - they are Jesus' children just like the little ones here in Australia, and He loves them just the same!